The recipe came from our neighbors who clipped it out of a magazine and gave it to us. I think it’s funny that our neighbors know us as boozers and give us drink recipes. Funny both in a good way and a bad way. 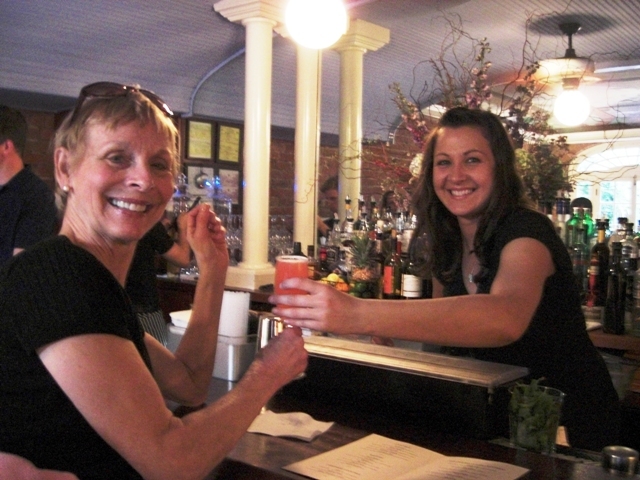 I learned to appreciate bourbon in New Orleans, where I had my first Sazerac made by The World’s Best Bartender on the Other Side of the Mississippi (a.k.a. Kate). Girl made a mean one, and I have always enjoyed the taste of the brown stuff since, though not straight up. That may change now that Rebel Yell is available at our local TJs. That’s what Emmett used in The Bourbon Delight and I have to say, I’m a little worried that half way through my day, I feel a craving for it sneaking up on me. Maybe it’s just the heat. Bourbon seems to work well with near triple-digit temps, which is what we’ve been having for the past week. Let’s hope with the cool down my cravings will go away. If not, there may not be enough Rebel Yell in this town to keep this girl from going heat crazy. 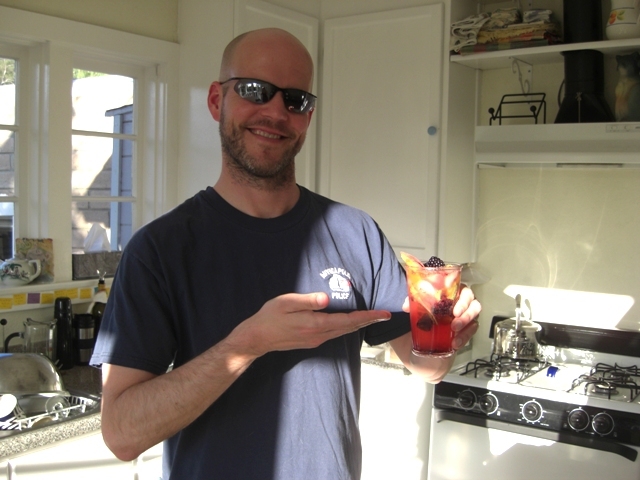 This drink gets not only a big thumbs up from me, but our neighbors as well. We had them over for Happy Hour to test drive it and they went home definitely Happy! Clean, crisp, and despite all the fruit, not sweet at all. Cheers! 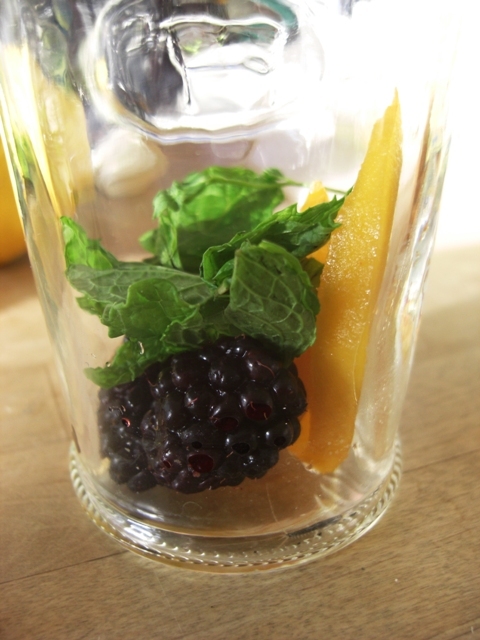 In a double old-fashioned glass, combine the 3 peach slices and 3 blackberries, mint, lemon juice, and agave nectar. Mash gently with the back of a spoon until fruit releases juices. Add the bourbon and mix. 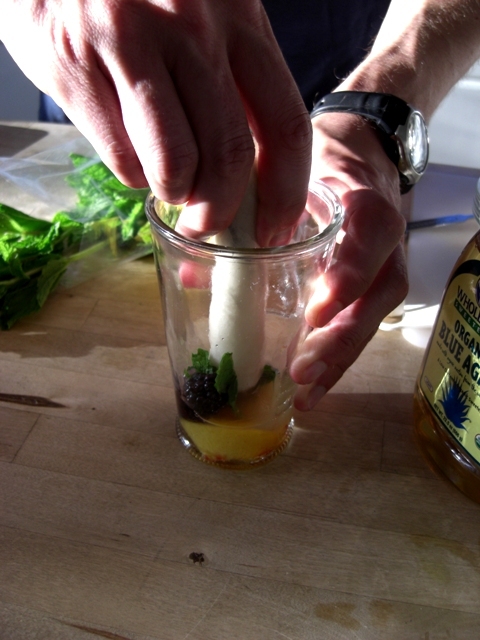 Fill glass with ice, top off with club soda, and give it one final stir. 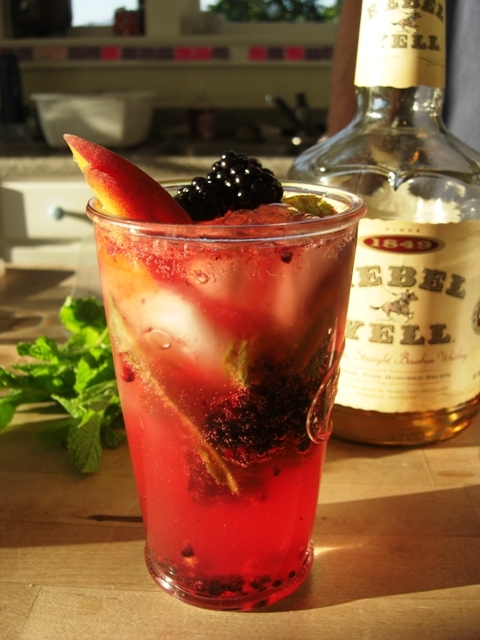 Garnish with peach slices and blackberries, sit back, and enjoy.